Here at Eagle Creek, we believe in smart travel that yields unforgettable experiences. That’s why we’ve teamed up with Expedia.com; to encourage you to pack your weekender bag, check into your Las Vegas hotel, and get ready for outdoor adventures, fabulous food forays, and plenty of other shenanigans. 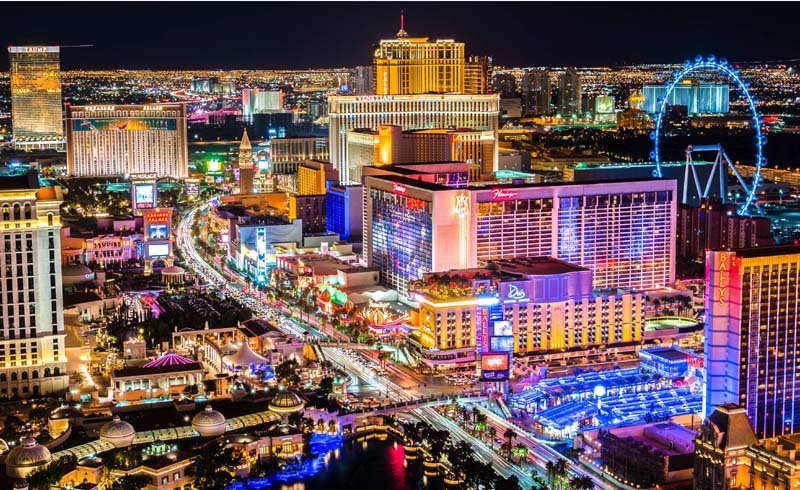 The glittering lights and endless party vibes of Las Vegas give the appearance of expensive, unattainable opulence. But—believe it or not—Sin City is the home of Champagne dreams on root beer budgets. Plus, overall, economy airfare prices are on the descent, making the commute through the clouds more affordable. According to Expedia’s 2016 year-end travel study, “New Heights for Air Travel,” economy travel prices are the lowest they’ve been in four years. So, book your tickets for Las Vegas and party like it’s 2013. Before you head to Vegas, pore over these seven tips for visiting Glitter Gulch on the cheap. Book easy on a Sunday morning. Believe it or not, there’s a day of the week and a pre-travel sweet spot when you’re most likely to get a stellar deal. Purchase your tickets on a Sunday approximately three weeks before your Vegas voyage to save an extra 11% for the dime slot machines. Cha-ching! Pro tip: Bundle your flights and hotel when you book to save more travel money and leave some cash in your pockets. 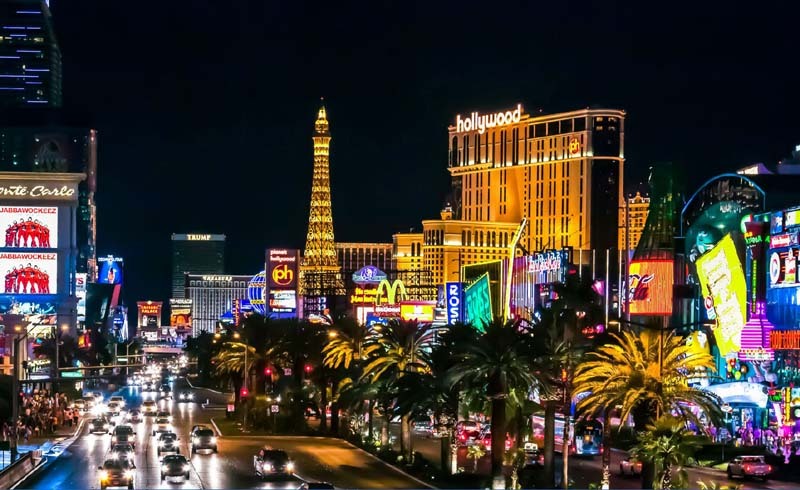 Ask any Vegas veteran and they’ll tell you, visiting Sin City is all about long weekends and late nights—not long vacations—which is great for your budget. Pack a compact carry-on bag, like a classic weekender or a backpack,and save anywhere from $25 - $50 on luggage-checking fees. Before you start stuffing your bag with reckless abandon, pick up some Eagle Creek packing organizers to compress clothes and help keep you organized. Think about your itinerary and pack only what you’ll need. Pro tip: For a weekend well spent, you’ll likely want an outfit or two for going out, and a casual ensemble with walking shoes for wandering through the Art District and historic downtown Vegas. And don’t forget your sunscreen. Las Vegas is in the middle of the desert. Las Vegas has some amazing hotel rates year-round, even on the Strip and downtown. You can even find a good room, near top attractions, for under $40 a night if you take the time to look. But in such a buzzing area, there are a few rates raisers you’ll want to watch out for. Unless you’re planning to attend a convention, avoid visiting when there will be a large event at the Las Vegas Convention Center, because rates go up as availability goes down. Pro tip: It might come as a surprise, but spring and autumn are the best seasons for planning a cheap getaway to Vegas. The weather is easygoing, you’ll skip the summer vacation rush, and accommodation rates are at their lowest. Yes, fresh air is plentiful near the city of neon lights, thanks to the expansive Mojave Desert. The gorgeous Red Rock Canyon National Conservation Area spans the landscape just 17 miles west of downtown Vegas. For less than the price of a cocktail, you can walk, drive, or ride a bike through the stunning mountain range, named for the color of the region’s iconic rock formations. Pro tip: Visit Red Rock Canyon at sunrise or sunset for a spectacular photo opp and hours of beautiful scenery. Find a front-row seat for people watching. Spectacular shows light up the Strip and downtown’s Fremont Street with breathtaking talent and artistry, but they can also be bank-breaking. If seeing the Blue Man Group live is on your bucket list, plan your budget around tickets, but if you’re looking for entertainment and some new cultural experiences, then find a prime café booth or park bench for some world-class people watching. Downtown Container Park is a mix of urban oasis, performance venue, dining destination, and indie shopping area—all sectioned off in repurposed shipping containers. Sit back with some delicious street-style eats and take in the contemporary arts scene as it buzzes around you. Many hotels and casinos boast impressive buffets and in-house restaurants with sweet deals for their guests. The prices can be especially delicious during the meal transition period, right at the end of lunch or after the dinner rush. For an even cheaper meal ticket, dine at a hotel food court. Several of the sparkling hotel casinos feature food courts brimming with counter-serve chains and cafes. It’s not fancy, but you may find your favorite comfort foods right there at Caesar’s Palace or the Venetian—for an equally comfortable cost. When it’s time to treat yourself to a boozy brunch, be honest with yourself. If you order one mimosa, you order two or three. Just like its lively nights that roll on till morning, Las Vegas is also known for endless brunch cocktails. So, rather than racking up a lengthy tab or trying to split the bill with your friends after you’ve had a few, go bottomless. Pro tip: If you’re window shopping at Tivoli Village, stop by Echo & Rig for $16 bottomless mimosas between 9 a.m. and 3 p.m.—one of the best deals in town. Hanging out downtown? You’ll find a similar deal and historical scenery at The Perch. Don’t roll the dice when it comes to your travel budget. Take advantage of this jetsetter-approved advice and enjoy all the shimmer and shenanigans Vegas has to offer. Without breaking the bank. Do you have any additional tips for traveling to Vegas on a budget? Feel free to share them in the comments below!